This year (2013) in Dublin alone, 100 such buildings were open for viewing. These ranged from Aras an Uachtaráin – the residence of the president of Ireland, to the Google Docks building, to an obscure Dublin artisans’ dwelling, built originally in c1909, but re-imagined for modern living. The range covers residential, cultural, educational, community, public and commercial buildings. 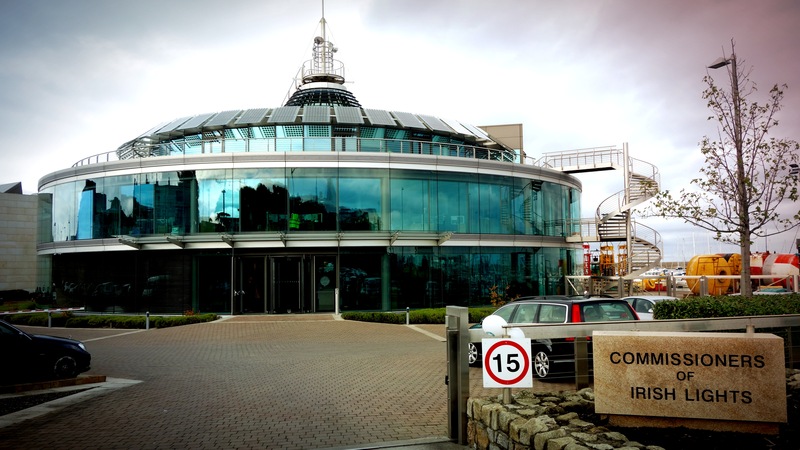 This October, microOBSERVER tagged along to see the iconic Commissioners of Irish Lights building in Dun Laoghaire, a borough of Dublin situated along the east coast. The building, designed by Scott Tallon Walker Architects, dates from 2008 and comprises two adjoining units traversed by a glass tunnel two stories above ground. The main building, a circular, contemporary glass enclosure, which mimics a lighthouse structure with a “lantern-like rooflight”, houses the main administration and operational offices. A ‘helical staircase’ sits directly under the rooflight, allowing access to all three floors while also permitting light to illuminate the centre of the interior. The building sports a sophisticated set of environmental controls which automatically cools or heats each area, including automatic localised control. For example, if a group of people schedule a meeting in one particular location, the system automatically detects this concentration of bodies and adjusts the ambient temperature accordingly. The concrete ceiling circulates either warm or cold sea water, which can be supplemented by local heating units if necessary in the winter. The computer controlled FMS (facade management system), automatically controls the extensive glazing (floor to ceiling) double-skin facade, activating dimming harnesses which responds to external sunlight conditions to prevent unwanted glare, while ‘permitting natural light to reach the interior’. It also acts as an acoustic buffer. If necessary, individuals can override these controls to suit their particular location needs in the office. An interior user-controlled fan ventilation system is supplementary powered by a circular set of roof-top photovoltaic panels. These panels are the same type that powers the many buoys that are dotted around the Irish coastline. 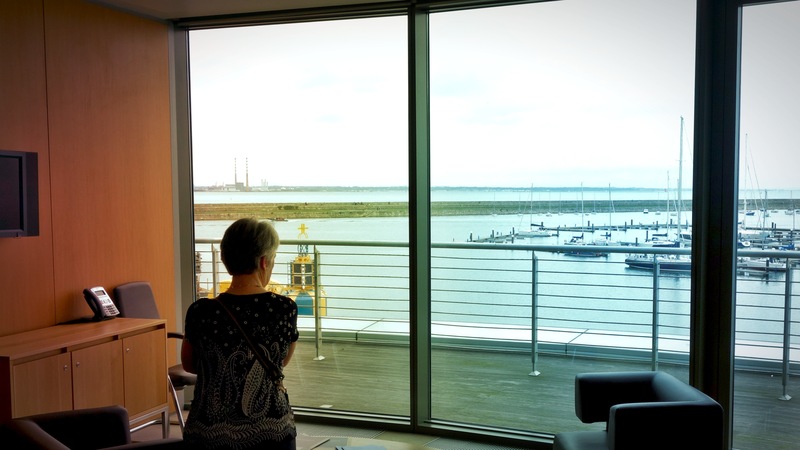 A visitor admires a panoramic view from one of the offices. The adjoining rectilinear building is home to a range of electronic, computer and mechanical workshops utilised in the maintenance of a variety of buoys. These play an important part in maintaining shipping within safe corridors, avoiding unseen underwater obstacles, such as hidden rocks or land masses, to wrecked ships. Each buoy is monitored 24 hours a day, and transmits extremely detailed information about weather conditions in the area, thus building up a comprehensive national map of coastal and sea environments necessary for the safe passage of all marine vessels. The centre also monitors all shipping carrying a mandatory AIS (automatic identification system), which along with radar and radio information gives invaluable data about each ship, including its position (more accurate than just GPS alone), the ship’s direction, how high or low the vessel is in the water, the type of vessel registered, its current cargo and a range of other cogent information. Basically, if you in a vessel travelling in Irish waters, this centre is aware of your existence, your sea route and cargo! The whole system is also linked to other government agencies, such as air-sea rescue and the Irish navy in case of emergencies etc. The buoys themselves have become more sophisticated over the years. Whereas once they utilised 1Kw (one kilowatt) bulbs, they now use LEDs (light emitting diodes), at one tenth the power requirement, but almost as effective in range. The automation of such systems means that they have replaced the traditional lighthouse keeper, along with all the necessary maintenance and support services. This has over time lowered costs, but also the number of people required to run the lighthouse service. In fact some of these lighthouses have been taken over by the Irish Landmark Trust, and can be rented out for short holidays or a weekend retreat, such as the Galley Head Lightkeeper’s House, Clonakilty, Co. Cork. The CIL maintenance building also houses an impressive two story painting room, where a special weather-resistant coating is applied to buoys to enable them to stand up to the rigours of sea life for an estimated two year period before being required to be repainted. From time-to-time despite the visibility and technology on board these buoys, they do occasionally get hit by passing ships. Unfortunately for those ship owners, the Lighthouse service does pursue those transgressors in order to recoup the cost involved in both recovering and replacing the device, which according to our tour guide, can amount to around €100,000 ($135,000 apx.)! Ouch. Not the kind of navigation mistake that a captain would want to be responsible for too often! All-in-all, the ‘Open House’ experience was both very enjoyable and informative, and microOBSERVER, can’t wait until October of next year to explore other architectural ‘treasures’!